So you want to go to San Diego Comic-Con but you don’t have a lot of cash. Don’t worry! It’s absolutely possible to enjoy the con with a small SDCC budget. Back when I first went to SDCC, I was an early 20-something retail employee with an extremely limited amount of disposable income. 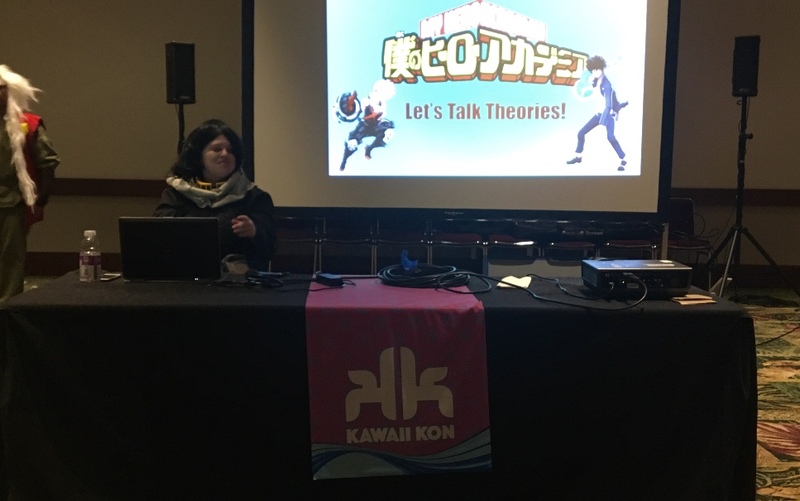 At first I thought the con was beyond my means, but I was incredibly determined to make it happen. Through some dumb luck I managed to snag a ticket and made the most of the con, even with an incredibly small SDCC budget. Even while doing everything as cheaply as possible, my experience was so fantastic I’ve continued to go back nearly every year since then. So don’t look at these prices and decide that it’s beyond the realm of possibilities. You, too, can do SDCC on a budget. This guide will cover food, badges, hotels, and transportation. Feel free to scroll and find the section that’s most relevant to you. We’ll go over the best ways you can save money at SDCC and experience the con as cheaply as possible. Disclaimer: Some external links are referral links and I’ll notate that accordingly with an asterisk. Your help keeping this website afloat by using referral links is always appreciated! This is the aspect of the SDCC budget that you have the most control over and an area where you can save the most money. The following food related tips will focus on two main areas of San Diego where con goers congregate: the Gaslamp district, where the primary activity of the convention takes place, and Mission Valley, a grouping of hotels a few miles away that many con goers end up staying. If you end up staying somewhere else, some of these tips may not apply perfectly. Still, you can take this information and tweak it to your hotel location with a few google searches if needed. Many restaurants around the convention in the Gaslamp district have special “convention menus” that have a limited kitchen and inflated prices. Honestly, you won’t save much money at restaurants around SDCC. 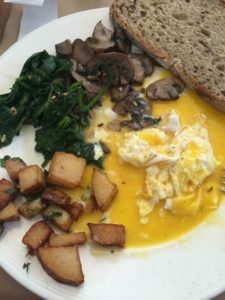 Still, it might be worth it to have a sit down meal once or twice just to take a break from the hustle and bustle of the con, but if you’re trying to save money you won’t want to do this for every meal. There’s been some years where I only ate at an actual restaurant once or twice during the entire con. Now I average about once per day, maybe twice a day before the con actually starts, and spend the rest of my time doing the budget options listed below. If you’re staying in Mission Valley, there’s fewer restricted menus and many more options, but things are much more spaced out there, so your mileage may vary as far as convenience goes. It’ll largely depend on what part of Hotel Circle you end up at. It’s not cheap and not all that good Though I confess that when I was stuck in a panel room all day I maybe broke down and bought the soggy pizza once or twice before. Consider con center food an option only if you’re starving and don’t have food in your bag. Don’t plan on this being your primary way to sustain yourself at the con if you want to remain healthy and save cash. If you follow the next few tips, though, you shouldn’t find yourself in this situation very often. If you are staying downtown, there’s a Ralph’s grocery store within walking distance of pretty much any Gaslamp hotel. There’s also one near Hotel Circle in Mission Valley, though it may or may not be within walking distance of your Hotel Circle hotel. Groceries is the best way to save money at SDCC and do the con as cheaply as possible. There is also a small liquor store behind the Hilton Gaslamp called Dis Cine, which has affordable meals, snacks, and alcohol. They recently expanded into the business next door and have even more options. And the best thing? There is rarely a line, which is hard to come by at SDCC. Amazon’s same day delivery may also be a viable option if your hotel is too far from a grocery store. You can check out Prime Day – Prime Pantry $3 bounty *, Try Amazon Prime 30-Day Free Trial *, or Try AmazonFresh Free Trial * if you want to explore this option cheaply. If you have a Safeway or Kroger’s discount card, it’ll work at Ralph’s, too. 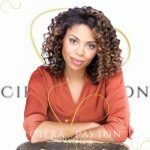 If you use the discount card (free to sign up!) and the ibotta app* together, you can save a ton of money not only for SDCC, but back at home outside of con life, too. I tend to save an average of $20-30 a month with ibotta alone. Protein: For omnivores, jerky is a great option. For vegetarians/vegans, or those that just don’t like jerky, various nuts are an excellent choice. Healthy Sugars: Dried fruit is best. Fresh fruit has a tendency to get smashed in your bag throughout the day, though if your hotel room is close enough to the con you can always store it there. Breakfast Bars: These have a great combination of protein, carbs, and sugars that’ll give you a decent energy boost. Don’t live off them entirely, but they’re good to have in your bag. Sandwiches: Like fresh fruit, these have a tendency of getting smashed in your bag. But, like fresh fruit, these can be helpful if you’re storing it in your room or have some sort of plastic sandwich holder to keep it fresh. Keep in mind that San Diego is hot, so any sandwich with meat in it may spoil! Microwavable food: Not every hotel has a microwave or a fridge! Check your hotel room before you do this. If you are lucky enough to have both, microwavable cups of noodles or popcorn are excellent snacks. WATER. Drink it. Lots of it. Bring an empty bottle to the con to cut down on costs even further (and help reduce waste). Fast food isn’t the healthiest option, but it’s cheaper than a sit down restaurant, faster, and generally convenient. It’s a good alternative for those with low to medium budgets and not a lot of time. The high protein and carb choices will also give you the energy to keep going at the con, but please, like, add some fruit or something to your diet (see above tip). There aren’t many fast food options in the Gaslamp district itself, but they exist if you know where to look. The most convenient one is Subway, which comes fully prepared for the huge crowds and a hugely popular choice with SDCC budget con goers. They will usually have basic pre-made sandwiches at a low cost ready to go the moment you walk up. Oftentimes the line looks incredibly massive, but when you get into it you’ll move at a fairly quick clip. They know 130,000 nerds are about to descend on their neighborhood and they’re ready for us. If you are staying in Mission Valley you’ll have a lot more options as far as fast food is concerned. Primarily you will want to hit up In N Out. 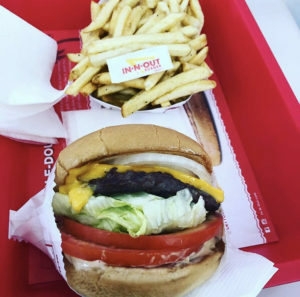 If you’ve never been to an In N Out before, you’ll want to correct your egregious error! It’s a California food staple and you just have to do it, dude. After you do that, if you want to mix it up, there’s a mall nearby with tons of other food options available in the food court. And, of course, there’s always Denny’s. As soon as SDCC rolls around, a few local shops throw together some temporary street food options. There’s a quick burger and fries stand at the base of the Hilton Bayfront as well as some pop up hot dog stands across the street from the convention center on harbor. These are usually reasonably priced, fast, and convenient, much like fast food. In my opinion, they tend to be tastier, too (with the exception of In N Out as noted above). Street food is a unique and interesting way to save money at SDCC and I highly recommend it. Can’t get cheaper than free, right? Unless someone is paying you to eat their food (if that exists at SDCC, I haven’t yet found it), this is the most economical option. SDCC is a land of shameless promotion and oftentimes those promotions come with free food and, occasionally, free drinks, too. It’s hard to list what options are available, though, as the promotional events vary every year. In the past I’ve found free food using the Mr Robot offsite activation, the NatGeo Nerd Nite party, the Wired Cafe (invitation only), and various other events. Keep your eye on the Friends of Comic-Con forum’s Offsite section for updates! 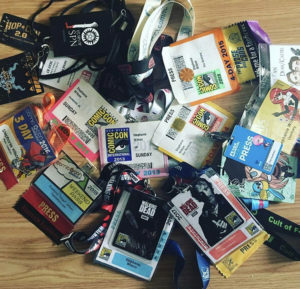 Badges are one of the hardest things to adjust in your SDCC budget. Unless you qualify for a comped or discounted badge, this price is going to remain the same. And worse yet the prices go up every year, so if you want to come back you’ll be facing an even steeper cost. However, it is possible to lower the cost on this if you qualify. You just need to do your research and plan accordingly. If you are an industry professional or journalist, you might be able to get in for free. You have to apply for this option, so make sure you have the credentials to prove it. Sometimes the application results aren’t announced until after all the regular badges are sold out, so you may have to buy a regular badge anyway, then refund it later if you get approved. Either way, you’ll be paying for a badge the first time you go if you are determined to attend. If you meet certain age criteria or you’re in the military, you might qualify for substantial discounts. 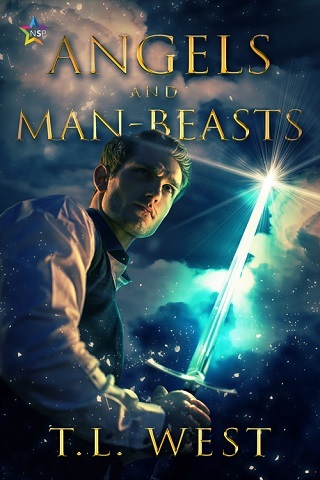 These are usually up to 50% off, so you can save a pretty hefty chunk of change here. Still, the vast majority of attendees aren’t either of these options. It’s important to note there is no legitimate secondary market for badges. If someone is offering a badge on something like eBay, they are either scamming you or violating SDCC policy. If caught breaking policy, you may be banned for life. So don’t do it. Besides, the badges people try to hawk on the secondary market usually have inflated cost anyway. So it’s not even a “budget” option, really. Please check out our SDCC Badge Guide for all the different type of badge options available, plus tips on how to apply and/or purchase them. 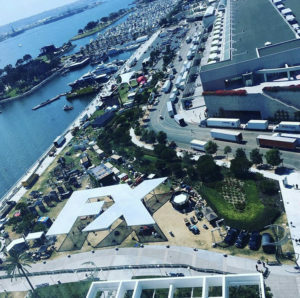 Hotels are another part of your SDCC budget that you’ll have a large amount of control over… as long as you are willing to room share and stay a bit further away from the con center. We have an extensive SDCC Hotel Guide, but I’m going to go over some of the main points here for you. You can save a lot of money at SDCC if you sacrifice some conveniences in regards to where you choose to stay. If you want to save money on a room, you’re going to want to find some roommates. Most hotels allow up to two people per bed, so with two beds you can ‘legally’ fit four people to a room. Who sleeps where is entirely up to you. Willing to sleep on the floor? Go for it. If you want to fit more than that in a room, more often than not that’s against the hotel policy (and likely against fire code), but ‘room stuffing’ is a long standing con tradition among budget attendees so play this game at your own risk. For obvious reasons, I can’t condone this here in this guide. You could get in trouble with the hotel or, depending on the severity of your room stuffing, you could be making situations dangerous in the event of a fire. But in my younger days I fit six or more people in a room and slept on the floor for cheap and didn’t spend a minute thinking about repercussions. Now that I’ve passed thirty years old the thought of sleeping on the floor for an entire con sounds horrific and I’m willing to pay more for a spot on a bed. Ideally two people per bed is safe, comfortable, and within hotel policy so my advice is to aim for that. The places closest to the convention center are obviously going to be the most expensive. Last year I stayed at the Hilton Bayfront directly next to the con center and it exceeded $400 a night. Hotels across the street in the Gaslamp are slightly cheaper, but still in the $300 range. However, back at my first full con I stayed in Mission Valley for $180 a night. Obviously part of that difference is going to be natural price inflation in the seven years between these cons, but a large part of it is location location location. 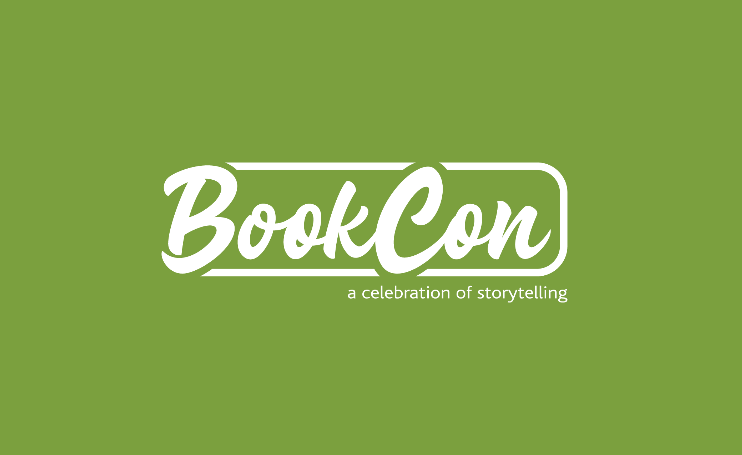 Sadly, the vast majority of discounts for hotel rooms (honors programs, AAA, etc) don’t work during the con since they use a third party booking service. Your hotel membership cards can get you discounts on other things, though. When we stay at the Hilton we tend to get free WiFi through their honors program. Marriot has similar perks. Some programs may give you free breakfast if you’re a member. Most of these programs are free to join, so it’s worth checking out! Some people stay in hostels or AirBnB’s with various rates of success. Please read our extensive Hotel Guide to determine if the effort involved is worth it to you. These options exist, but they are few and far between. And more often than not it’s not really that much cheaper than a hotel in Mission Valley. If you do manage to score an affordable alternative close by, though, congratulations! You’ve hit the jackpot. The cheapest mode of transportation is walking. The most expensive is renting a car. But what’s right for you? Let’s talk about the options. If you’re staying in the Gaslamp, almost everything is walkable. However, your hotel is going to be more expensive the closer you are to the convention center. You’ll have to determine if staying close and saving money on transportation is worth it or not. For me it absolutely is, but when I was younger it absolutely was not. As I said earlier in this guide, age has shifted my priorities a bit. I’m willing to pay more for proximity now when I wasn’t really before. The SDCC hotel shuttles are free, but have a habit of getting full very fast. You can stay at a cheaper hotel out in Mission Valley and not have to pay for transportation to the con, but you’ll also have to deal with lines getting to and from the convention center. Sometimes there’s no wait at all, and sometimes you wait for four or five shuttles to pass you by before one finally has enough room for you. So once again, weigh what is important to you and choose accordingly. 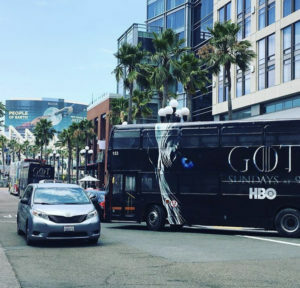 If your SDCC budget is the number one priority, stay in Mission Valley and take a shuttle. If you have a little bit of wiggle room, choose something else. Either stay closer or use a different transportation option. The trolley is extremely convenient and has two stops within easy walking distance of the con center. Some of the stops on the green line are out near Mission Valley, so if you don’t want to deal with the hassle of a shuttle bus, you’ve got another option. There are also hotels even further away, but you’ll find that all hotels in San Diego tend to tweak their prices upward when the con comes to town. Staying further out may be slightly cheaper, but still quite expensive compared to the rest of the year. Additionally, San Diego has an extensive bus system worth checking out if you stay further away from the con or outside the hotel shuttle routes. Unfortunately I don’t have any personal experience with the bus system in San Diego, so I can’t confirm how efficient it is. These options are not free, but there are usually discounts and multiday tickets available. It’s a cheap SDCC transportation option that I highly recommend. I first downloaded Lyft* at SDCC 2014. They were passing out free coupons for your first ride and I was eager to take advantage of that. The following year Uber was offering a free first ride and I took advantage of that, too. That was two years where I didn’t have to pay for my ride back to the airport at all. Now years later I’ve decided I enjoy Lyft a lot more and take them almost exclusively, but in general they offer the same type of service. When traveling around the Gaslamp you’ll rarely pay more than $10 for a ride and will frequently pay even less when certain promotions are running. I usually end up taking a Lyft once a day or so at the con, usually at night after I’ve become a bit too intoxicated and/or exhausted to want to trudge back to my hotel room. It’s by far my favorite way to get around the Gaslamp. Please remember to tip your driver. This is a cheap SDCC tip guide, but those drivers work hard so account for gratuity for your drivers. I’m going to be honest. I hate the vast majority of rental bike and scooter programs. The ones that don’t have designated lock up spots end up scattered on sidewalks and in ditches and thrown in canals. 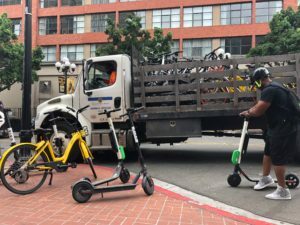 Last year they were a new option in San Diego and I witnessed the city picking up stray bikes and scooters and tossing them into the back of trucks like they were garbage. The city doesn’t like them. People who use sidewalks and are tired of tripping over discarded scooters and bikes don’t like them. And I’m fairly certain the convention center is quickly getting irritated by them being abandoned at various locations around their building, too. I don’t have sources to back that last claim up, but honestly they are a nuisance and I wouldn’t be surprised. Several Lime scooters were blocking an entrance last year and the con center staff seemed super pissed about it. The companies that have specific drop off and pick up locations are a bit better, though you may still have trouble finding one to get to and from the con center in a reasonable time frame. Finding pick up and drop off locations close enough to both your hotel and the con center to make using this option worth it may prove to be challenging. Out here in my home town they are fairly popular as the drop offs and pick ups are aimed towards commuters. It’s easy to find one near your house and get to work. In San Diego near the con center? Might not be as convenient. Now that I’ve thoroughly bashed this option, feel free to do your own research and determine if this is actually a viable option for you. Here’s some companies: Jump, Lime, Discover, Bird. What’s the point of taxis nowadays? Lyft and Uber are cheaper. But taxis do line up outside of hotels, so sometimes it’s tempting to just hop in the back of one and head out. Weigh the cost versus convenience and plan accordingly. Personally I don’t plan on ever taking a taxi again anywhere. But that’s a story for another time. The only reason a car rental will be economical is if you are staying for free somewhere nearby. In that situation, the cost of the rental, gas, and parking may be cheaper than a hotel. But even if you find a somewhat affordable room in San Diego, the cost of a rental car is going to make it around the same price or more expensive than a hotel in the Gaslamp. A lot of people crash with friends, though, so a car makes sense. So there you have it. With this guide you’ll hopefully be able to save some cash on food, hotels, and transportation. And maybe, just maybe, you’ll qualify for a discounted or complimentary badge as well. I wish you and your budget SDCC experience luck! Are you an SDCC veteran? 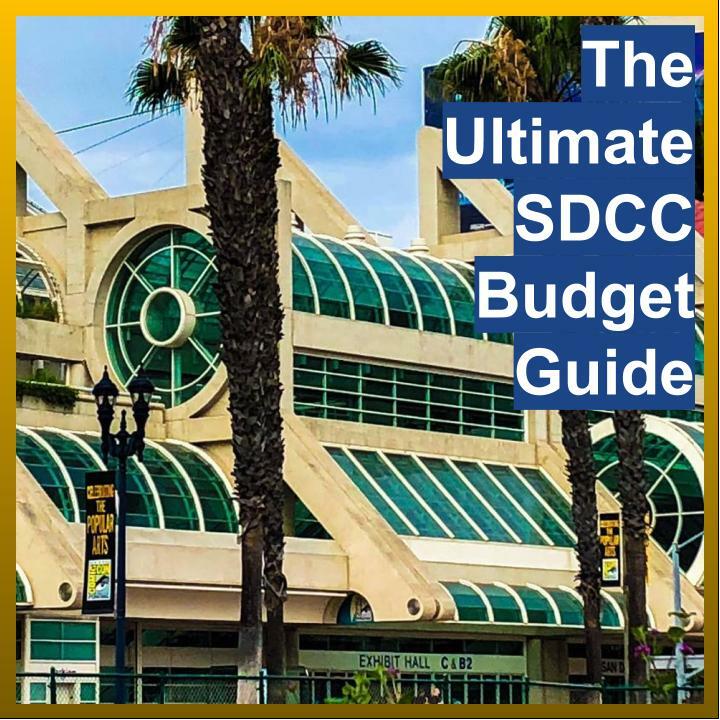 Have an SDCC budget tip you want to share? Know how to do SDCC for cheap? Comment below! Next: Fuse Announces New Docs, Premiere Dates & New Film Franchise You Should Know About! On the topic of discounting badge prices. “Still, the vast majority of attendees aren’t either of these options.” Do you have stats to support this statement. Personal experience and observation.. SDCC does not release stats. Based on my interactions over the past 8 years, the vast majority of attendees I’ve encountered had regular attendee badges, which hang around their neck visible for everyone to see. The badges marked for press look very different. Now they are completely different colors, so I can spot who is and isn’t press without even chatting with a person to find out. Exact numbers? No. SDCC doesn’t release them. But I’ve viewed thousands of badges with my own eyes since 2011 and the vast majority are not press badges. Additionally, as far as age and military discounts, most attendees I see (again, with my own eyes, so a personal observation) fall between the age range demographics that aren’t eligible for the discounts. Most children are obviously children and most people over 65 are obviously over 65 (granted, some people age well). This is pretty straight forward. It fluctuates, but it’s less than 1% of the population. So again, the vast majority is not eligible for that.